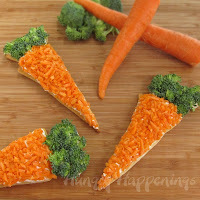 Great way to get the kids to eat vegetables, Easter Egg Veggie PizzaKids will enjoy helping assemble the pizza. Decorating Easter eggs was always one of my favorite activities at Easter. I enjoy it so much, that even after all my nieces and nephews got too old to want to partake in the activity, I invited friends with small kids over to do so. Of course those kids got older too, so it has been a few years since I’ve decorated an Easter egg. This year, I at least decorated some food to look like an Easter Egg. I went to the grocery store last week to buy the ingredients to make my Carrot Shaped Veggie Pizzas and right next to the broccoli was purple cauliflower. I had never seen purple cauliflower and just couldn’t pass it up. Immediately I envisioned a veggie pizza decorated to look like an Easter Egg using a rainbow of colorful vegetables. Easter eggs can be decorated any way you like using a few or a lot of different colors. The design I chose incorporated the purple cauliflower, orange and yellow peppers, green celery, and some orange carrots. 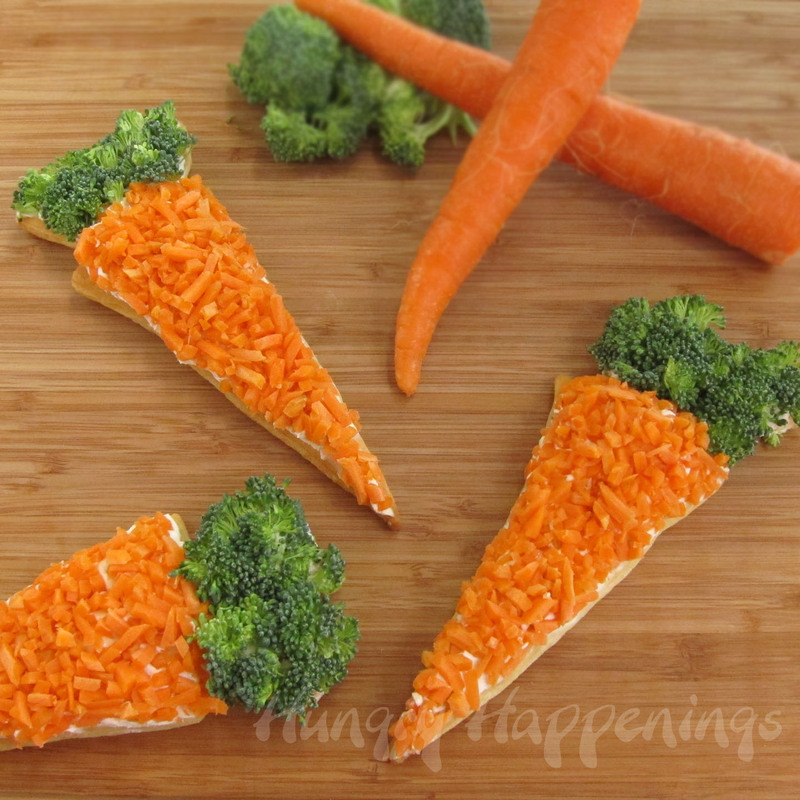 You, of course can decorate your Easter Egg Veggie Pizzas any way you like using your favorite vegetables. You may even get non-vegetable loving kids or adults to eat this pizza. I haven’t eaten cauliflower in many, oh, so many years, and thought I’d pick it off this pizza before eating it. I really just bought it because it was purple, but found it palatable mixed with the other veggies and was surprised that I did indeed eat it. Just a note: I should have set a piece of parchment paper on top of my cutting board before proceeding, but didn’t. I would recommend it, as it will be easier to move your egg to the baking sheet. Dust your cutting board (or parchment paper) with flour. Un-fold puff pastry sheet and set on cutting board (or parchment paper.) Sprinkle some flour over top of dough. Use a rolling pin to roll the dough so that it increases in length to 13″ long. Use a pizza wheel or knife to cut a large egg shape out of the dough. Move your egg to a parchment paper lined baking sheet. This is where it would have been easier to have it on the paper already. Use a fork to prick holes all over the dough. Optional: brush heavy cream or egg wash over the entire egg. Refrigerate for 30 minutes. Meanwhile, preheat oven to 400 degrees. Bake egg for 18-22 minutes until golden brown (longer if you like it really dark.) Allow to cool completely. Spread veggie cream cheese over crust. Decorate with vegetables and serve. You can refrigerate your pizza for a few hours or up to two days. Serves: 24 Ingredients 2 dozen eggs your choice of type of mustard Mayonnaise or use yogurt if you like Sweet pickle relish Celery Salt Paprika Part of a can of black olives and carrot slivers Instructions Hard boil a couple dozen eggs (or adjust for the size of the group to feed). I always put them in cold water after boiling and then put in the fridge for at least 10 minutes – makes them easier to peel. Mix together the mustard, mayonnaise, pickle relish, and celery salt. Taste and adjust as needed. Sprinkle some paprika on last. The pickle relish is my secret ingredient and makes them very flavorful – really – try it. A healthy fall treats that the kids can help make. It is gooey and delicious! Heat the oven to 350 In a saucepan, stir together 1 cup of brown sugar, 1 cup of water, 2 Tablespoons of butter, a pinch of nutmeg and cinnamon. Bring to a simmer and cook 5 min to make syrup. Core and peel the top third of 4 baking apples such as Cortland. 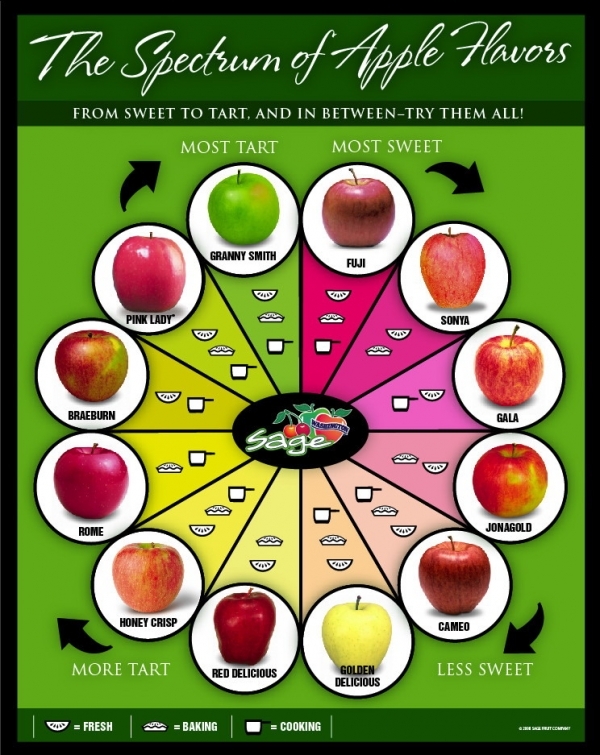 (Below is a chart of apples and what they are best used for) Place then in a baking pan, fill the with raisins ( or cranberries) and walnuts ( or almonds) then pour the syrup over them. Bake for 40 min. Serve warm with ice cream or yogurt on top , if you like. INGREDIENTS: 2 apples 2 tablespoons brown sugar 1 teaspoon ground nutmeg 1 teaspoon ground cinnamon 2 teaspoons butter DIRECTIONS: 1. Core the apples, leaving the bottom intact. 2. In a bowl, mix the brown sugar, cinnamon and nutmeg. Spoon the sugar mixture into the apples and set a teaspoon (or more to your taste) of butter on top of each apple. Place the apples in a deep casserole dish and cover. 3. Microwave for 3 1/2 to 4 minutes or until tender. Let the apples sit for a couple minutes before serving. Pumpkin seeds are loaded with vitamins and minerals, but also with polyunsaturated omega-6 fats. Pumpkin seeds are a good source of zinc, protein, iron, manganese, and muscle relaxing magnesium also sleep promoting tryptophan, Helps promote joint health and reduce inflammation. Those fats are very fragile and can go rancid quite quickly so seeds prepared this way should be kept in a air-tight container in the refrigerator and eaten in less than a week. This is also a nice snack kids will like and is very quick to prepare. It’s a great way to use the seeds you get when carving the Halloween pumpkins. Simply rinse and dry the seeds before using them. Preheat your oven to 350 F. In a bowl, toss the pumpkin seeds with the melted oil, chili powder, sea salt and cayenne pepper; Spread on a baking sheet and bake for about 10 minutes. Let cool and serve or store in the refrigerator in a air-tight container. Decorating Easter eggs was always one of my favorite activities at Easter. I enjoy it so much, that even after all my nieces and nephews got too old to want to partake in the activity, I invited friends with small kids over to do so. Of course those kids got older too, so it has been a few years since I've decorated an Easter egg. 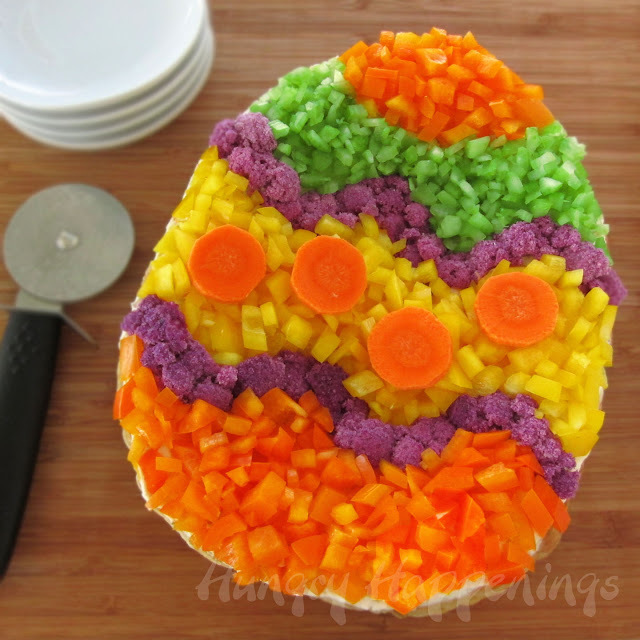 This year, I at least decorated some food to look like an Easter Egg. I went to the grocery store last week to buy the ingredients to make my Carrot Shaped Veggie Pizzas and right next to the broccoli was purple cauliflower. I had never seen purple cauliflower and just couldn't pass it up. Immediately I envisioned a veggie pizza decorated to look like an Easter Egg using a rainbow of colorful vegetables. Easter eggs can be decorated any way you like using a few or a lot of different colors. The design I chose incorporated the purple cauliflower, orange and yellow peppers, green celery, and some orange carrots. 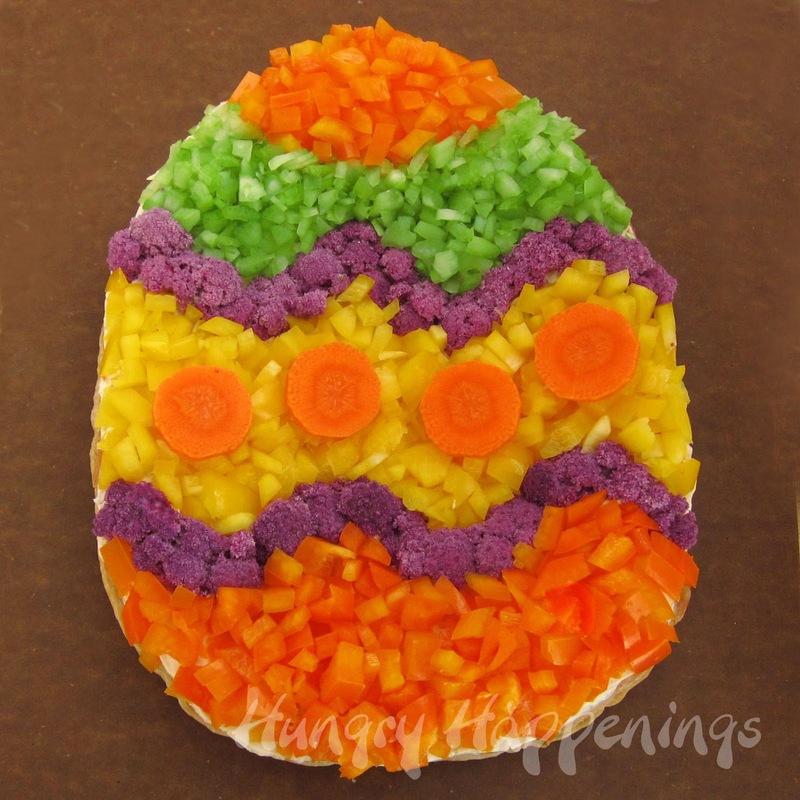 You, of course can decorate your Easter Egg Veggie Pizzas any way you like using your favorite vegetables. You may even get non-vegetable loving kids or adults to eat this pizza. I haven't eaten cauliflower in many, oh, so many years, and thought I'd pick it off this pizza before eating it. I really just bought it because it was purple, but found it palatable mixed with the other veggies and was surprised that I did indeed eat it. Just a note: I should have set a piece of parchment paper on top of my cutting board before proceeding, but didn't. I would recommend it, as it will be easier to move your egg to the baking sheet. Dust your cutting board (or parchment paper) with flour. Un-fold puff pastry sheet and set on cutting board (or parchment paper.) Sprinkle some flour over top of dough. Use a rolling pin to roll the dough so that it increases in length to 13" long. Use a pizza wheel or knife to cut a large egg shape out of the dough. Kids love to finger paint but most finger paints contain gluten. Here is a great recipe that is easy to make and inexpensive. In a medium pan, mix all the ingredients together to make the finger paint. Cook over low heat 10 minutes. Keep stirring the finger paint mixture until it is smooth and thick. After the finger paint has thickened take the pan off the stove and let the mixture cool. After making this I though, I wonder how it would come out using juiced fruit and vegetables for coloring. I will experiment with replacing the water with juice and I'll tell you what the outcome is. Most children like to play with clay, but the most common brands all contain wheat. Most homemade recipes call for wheat flour. By Making your own it reduces cost and you can make it wheat free. Have fun making your own gluten-free clay with your child and then spend countless hours playing with it. And if your mini Michael Angelo is a clay eater ( as many are) , don't worry. Mix first 4 ingredients in a mixer. Then add powdered sugar. Knead until the dough is smooth, divide into portions and add natural food colors if desired. Store in airtight containers ( zip lock bags) and place in refrigerator to store to prevent spoiling. Combine all ingredients in a pot and cook over low heat until a ball forms. Take it off the heat and let it cool to touch. Form into balls and store in an air tight container. Just one 8-ounce glass of milk provides the same amount of vitamin D you'd get from 3.5 ounces of cooked salmon, as much calcium as 2 1/4 cups of broccoli, as much potassium as a small banana, as much vitamin A as two baby carrots and as much phosphorus as a cup of kidney beans! So don't forget to drink your milk everyday!